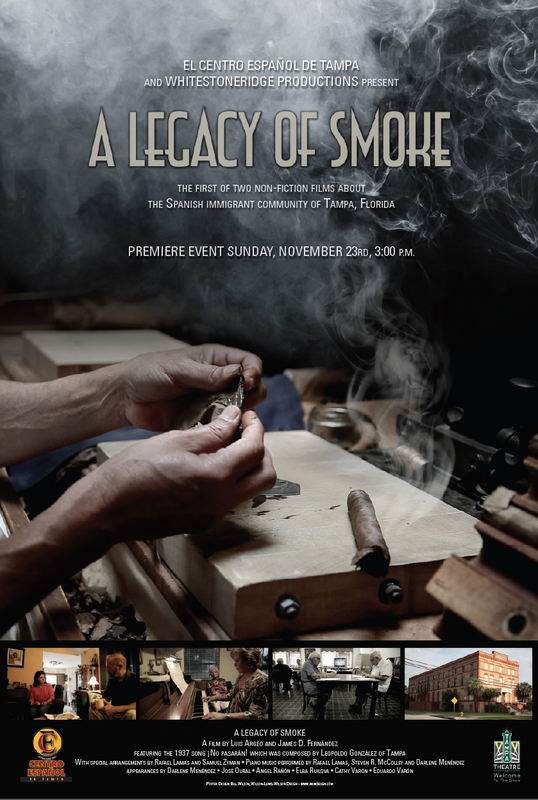 A Legacy of Smoke/Un legado de humo is the second documentary project produced by the collaboration between James D. Fernández and Luis Argeo. Fernández and Argeo are creating a vast on-line archive that will document the history of Spanish immigration to the US (tracesofspainintheus.org), and plan to produce a series of documentary films based on that archive. Their first film “La paella de Daniel Albert/ Dan Albert’s Paella” focuses on Spanish immigrants on California’s Monterey peninsula, and is currently being screened at special events and festivals. It has been screened at two international film festivals (“Migrant Film Festival” in Lublovja, Slovenia, “Alcances” in Cádiz, Spain) as well as at universities and cultural centers in Spain and the US. Argeo and Fernandez traveled to Tampa on several occasions in 2012 and 2013 to conduct fieldwork; filming interviews with, and scenes in the lives of, a wide range of descendants of Tampa’s original immigrants from Spain. Tampa’s cigar industry –which played a crucial role in the development of this major southeastern city– was brought to the area from Cuba and Key West starting in 1886 by a group of enterprising Spaniards. When, in that year, Vicente Martínez Ybor and Ignacio Haya cleared land to build their factories and workers’ homes in what we now call Ybor City, Tampa had roughly 700 inhabitants: by 1930, Tampa had become the cigar capital of the world and was home to more than 100,000 people. The film poetically juxtaposes the scale and intensity of the Spanish presence in Tampa in its early years –still clearly visible in the city’s monuments, cigar factories, social clubs and cemeteries, for example– with the the precarious and precious legacy that is lovingly preserved in the hearts, minds and albums of the descendants.